The Greta Graduated Round Cubic Zirconia Bangle Bracelet Large Version is a modern twist on a classic point in time. 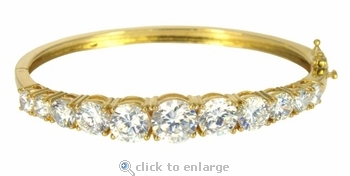 This slightly oval bangle includes 11 graduated diamond quality round cubic zirconia stones that are hand cut and hand polished to exact diamond specifications. The center round cubic zirconia measures 2.5 carats and the other cubic zirconia rounds graduate down in size for an approximate 12.5 carats in total carat weight. 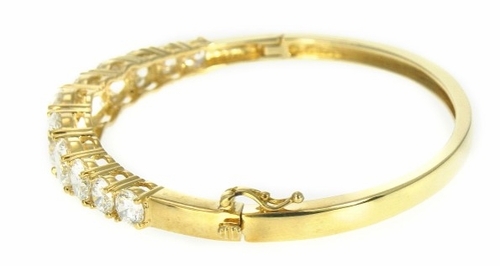 This bracelet measures 2.75 inches long and 2.25 inches wide and is designed as a seven inch wrist bangle with a male/female hinged clasp system. If you require a larger or smaller size, please call us for special order quote. This version is the larger version. A smaller version of the Greta Bangle is also available, please see item B1036. Choose from 14k white gold or 14k yellow gold. For further assistance, please contact us directly at 1-866-942-6663 or visit us via live chat and speak with a knowledgeable representative.